Mats August Norlin was born November 17, 1856, in Nordanå, Åmots Bruk, Åmot, Gästrikland, Sweden, and died February 11, 1932, in Saxeville Twp., Waushara Co., WI, at age 75. Buried in Sheridan Cemetery (formerly Sessions Prairie Cemetery), Farmington Twp., Waupaca Co., WI. He is the son of Anders Matsson Norlin of Åmots församling, Gästrikland, Sweden, and Anna Matsdotter of Nain, Gustav Adolf församling, Värmlands län, Värmland, Sweden. Louisa "Louise" Andersdotter was born January 1, 1861, in Sweden, and died December 5, 1900, in Waupaca Co., WI, at age 39. Sheridan Cemetery (formerly Sessions Prairie Cemetery), Farmington Twp., Waupaca Co., WI. She is the daughter of John Conrad Andersson of Sweden, and Mary Unknown of Sweden. 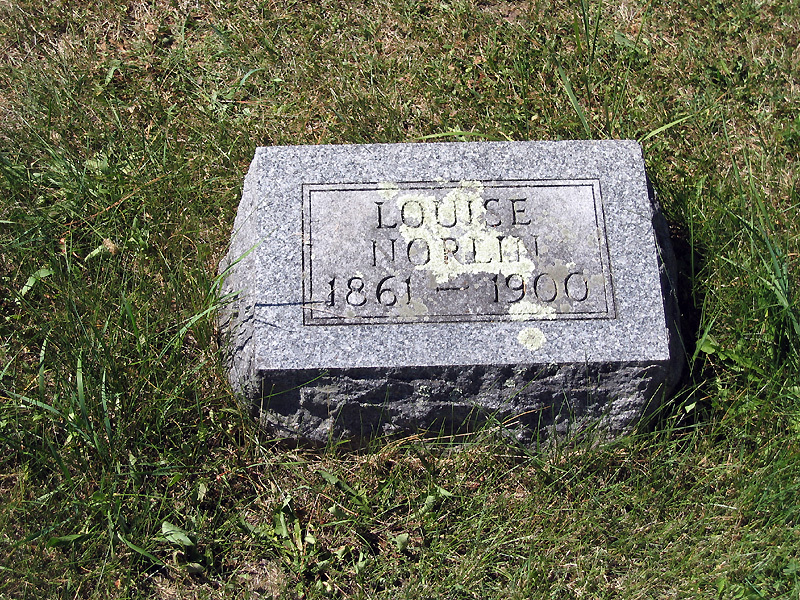 Mats August Norlin and Louisa "Louise" Andersdotter were married about 1883 in Waupaca Co., WI. 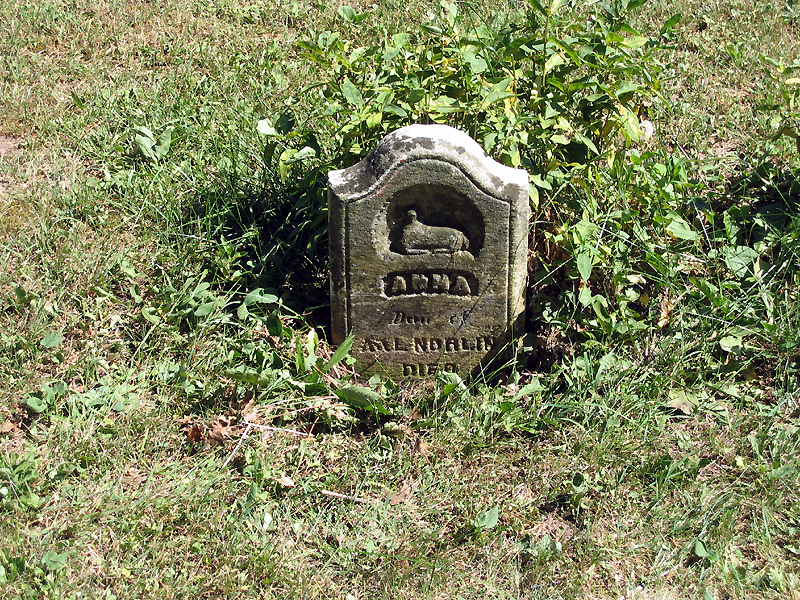 Anna Norlin: Born August 16, 1886, in Farmington Twp., Waupaca Co., WI; Died January 14, 1887, in Farmington Twp., Waupaca Co., WI (age Infant). Buried in Sheridan Cemetery (formerly Sessions Prairie Cemetery), Farmington Twp., Waupaca Co., WI. Grace Norlin: Born January 6, 1888, in Farmington Twp., Waupaca Co., WI; Died died January 3, 1951, in Rockford, Winnebago Co., IL, at age 62. Married June 22, 1904, in Wisconsin to Adolph Gustov Peterson: Born March 26, 1880, in Varmland, Sweden; Died May 9, 1951, in Rockford, Winnebago Co., IL (age 72). 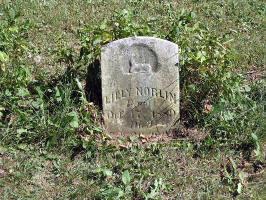 Lilly Norlin: Born October 17, 1889 in Farmington Twp., Waupaca Co., WI; Died February 26, 1890 in Farmington Twp., Waupaca Co., WI (age Infant). Buried in Sheridan Cemetery (formerly Sessions Prairie Cemetery), Farmington Twp., Waupaca Co., WI. William Andrew Norlin: Born January 31, 1891, in Farmington Twp., Waupaca Co., WI; Died February 3, 1975, in Waupaca, Waupaca Co., WI (age 84). Buried in Lakeside Memorial Park, Waupaca, Waupaca Co., WI. Married July 23, 1916, in Waupaca, Waupaca Co., WI, to Mette Eleanor Hansen: Born October 19, 1881, in Farmington Twp., Waupaca Co., WI; Died October 9, 1960, in Route 1, Amherst, Lanark Twp., Portage Co., WI (age 78). Buried in Lakeside Memorial Park, Waupaca, Waupaca Co., WI. 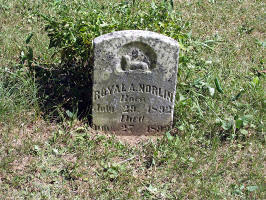 Royal August Norlin: Born July 29, 1892, Farmington Twp., Waupaca Co., WI; Died November 22, 1892, in Farmington Twp., Waupaca Co., WI (age Infant). Buried in Sheridan Cemetery (formerly Sessions Prairie Cemetery), Farmington Twp., Waupaca Co., WI. 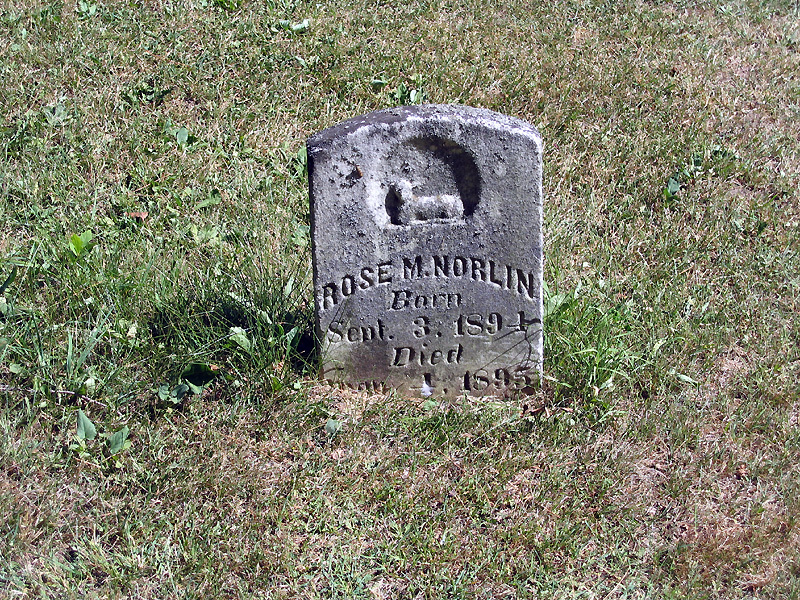 Rose Myrtle Norlin: Born September 3, 1894, in Lind Twp., Waupaca Co., WI; Died May 4, 1895, in Lind Twp., Waupaca Co., WI (age Infant). Buried in Sheridan Cemetery (formerly Sessions Prairie Cemetery), Farmington Twp., Waupaca Co., WI. Mae Elsie Norlin: Born April 4, 1896, in Lind Twp., Waupaca Co., WI; Died November 10, 1922, in Milwaukee, Milwaukee Co., WI (age 26). Married about 1915 in Wisconsin to John Henry Armon: Born November 8, 1893 in Waupaca Co., WI: Died April 8, 1949, in Milwaukee, Milwaukee Co., WI (age 55). Esther Lillian Norlin: Born June 12, 1898, in Lind Twp., Waupaca Co., WI; Died March 20, 1976, in Round Lake, Lake Co., IL (age 87). Married (1) November 11, 1922 in Unknown to Unknown Anderson: Born Unknown; Died Unknown. Married (2) about 1945 in Illinois to Unknown Smith: Born Unknown; Died Unknown., and lived in McHenry, IL, in 1951. Married (3) about 1960 to Harvey John Graff: Born March 30, 1894, in Detroit, Wayne Co., MI; Died Unknown. Ruth Evelyn Norlin: Born October 5, 1900, in Lind Twp., Waupaca Co., WI; Died January 5, 1901, in Lind Twp., Waupaca Co., WI (age Infant). Following Louisa "Louise" (Andersdotter) Norlin's death, August Matias Norlin married Christina "Christine" Andersdotter. 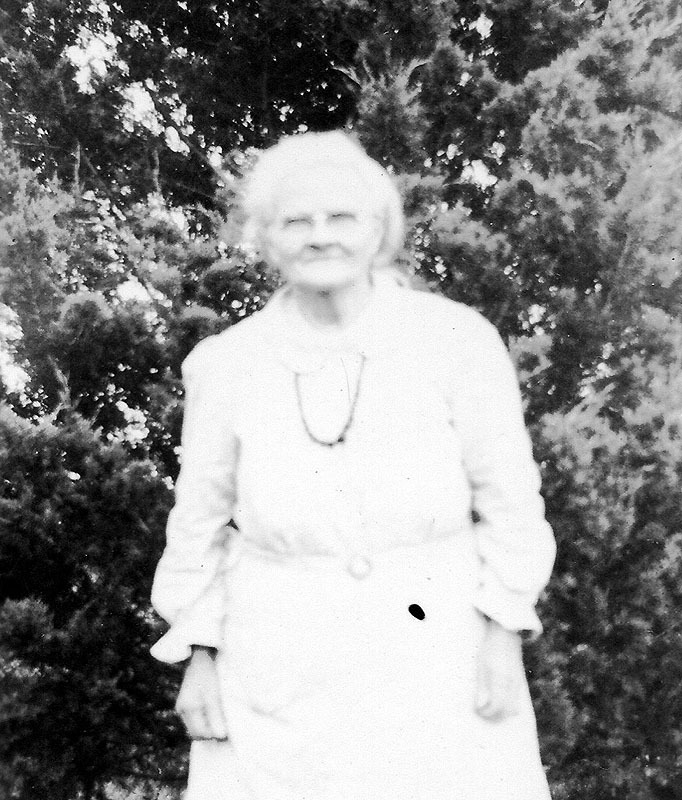 Christina "Christine" Andersdotter was born July 15, 1870, in Flyryd, Blekinge lan, Sweden, and died October 15, 1964, in Jude Nursing Home, Wautoma, Waushara Co., WI, at age 94. Buried in Saxeville Union Cemetery, Saxeville Twp., Waushara Co., WI. She is the daughter of Andreas Larsson of Fröbbestorp, Torsas, Kalmar lan, Smaland, Sweden, and Anna-Karin Svensdotter of Bredavik, Blekinge lan, Sweden. Christine lived in Stockholm, Sweden for several years, returned home to her parents, and then left for Waupaca, WI, in 1882. Mats August Norlin and Christina "Christine" Andersdotter were married October 21, 1901, in Lind Center, Lind Twp., Waupaca Co., WI. Seigrid Sylvia Boralind Norlin: Born January 23, 1903, in Lind Twp., Waupaca Co., WI; Died April 29, 1999, in Lake Zurich, Lake Co., IL (age 96). Buried in Saint James Catholic Cemetery, Neshkoro, Marquette Co., WI. Married about 1921 in Wisconsin to Earl Leo Roche: Born December 7, 1897, in Seneca Twp., Green Lake Co., WI; Died April 9, 1989, in Milwaukee, Milwaukee Co., WI (age 91). Buried in Saint James Catholic Cemetery, Neshkoro, Marquette Co., WI. 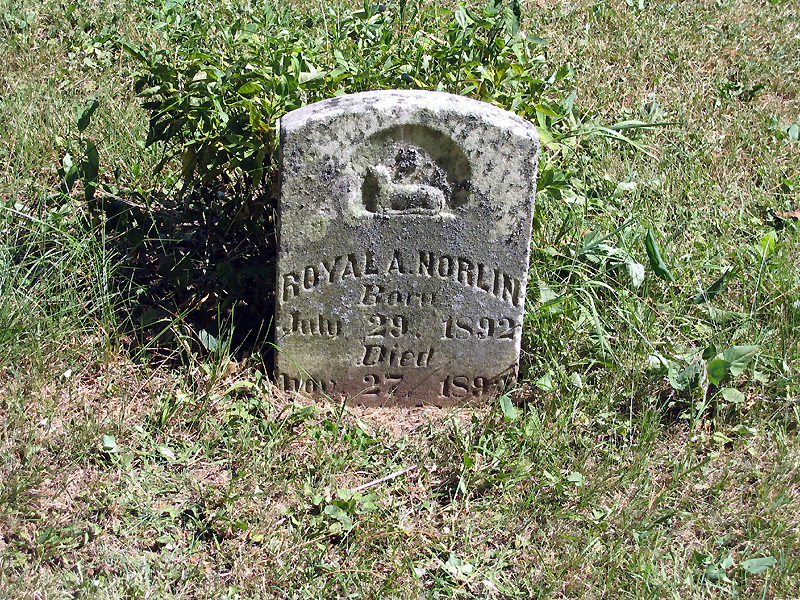 Reuben A. Norlin: Born April 8, 1904, in Lind Twp., Waupaca Co., WI; Died May 4, 1904, in Lind Twp., Waupaca Co., WI (age Infant). Frida Maria Constance Norlin: Born May 16, 1905, in Lind Twp., Waupaca Co., WI; Died December 12, 1980, in Green Bay, Brown Co., WI (age 75). Buried in Saint James Catholic Cemetery, Neshkoro, Marquette Co., WI. Married November 19, 1922, in Wisconsin to Stephen Francis Roche: Born June 27, 1892, in Seneca Twp., Green Lake Co., WI; Died April 20, 1970, at the Parkview Nursing Home, Ripon, Fond du Lac Co., WI (age 77). Buried in Saint James Catholic Cemetery, Neshkoro, Marquette Co., WI. Clarence Roger Norlin: Born January 17, 1907, in Waupaca Co., WI; Died July 29, 1984, in Wild Rose, Waushara Co., WI (age 77). Buried in Saxeville Union Cemetery, Saxeville Twp., Waushara Co., WI. Married July 25, 1936, in Columbus, Columbia Co., WI, to Anna E. "Ann" Gray: Born February 2, 1910, in Mather, Juneau Co., WI; Died April 24, 1984, in Wild Rose, Waushara Co., WI (age 74). Buried in Saxeville Union Cemetery, Saxeville Twp., Waushara Co., WI. Leigh Larson note: Sisters, Sylvia and Freeda Norlin, married brothers, Earl and Stephen Roche. Mats August Norlin was a Blacksmith in Sweden, and a Farmer and Blacksmith in Wisconsin. He came to the United States in 1882. Buried in Sheridan, Farmington Twp., Waupaca Co., WI. The Norlin family plot is in Section 1, Lot B, Plot 4 of the Sheridan (formerly Sessions Prairie) Cemetery, Farmington Twp., Waupaca Co., WI. Buried there are Anna, August M., Lilly, Louise, Rose and Royal. Mats August Norlin was born Nordanå, Åmots Bruk, Åmot, Gästrikland, Sweden. Died in Waupaca County, WI. Buried at Sheridan, WI. After serving in the armed forces, August changed his last name to Norlin (Northland) as permitted by law for men in the armed forces. His last name would have been Matson. The custom in Sweden was to take the first name of the father, (Matias Andrew Anderson) and add son to the end (Mattson, Matson). He was a gunsmith in Sweden, farmer and blacksmith in U.S.A. His house in Sweden was still standing in 1978. 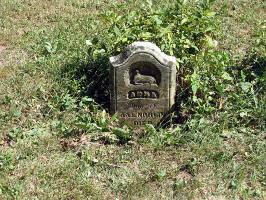 August was married at Waupaca and is buried at Sheridan, about 6 miles west of Waupaca with Louisa, his wife Anna, and Lilley, Royal and Rose, his infant children. 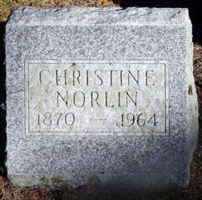 Christina "Christine" (Andersdotter) Norlin is buried in Saxeville Union Cemetery, Saxeville Twp., Waushara Co., WI. Thanks to Find-A-Grave for making this image available. Mats August Norlin was born November 17, 1856, in Nordanå, Åmots Bruk, Åmot, Gästrikland, Sweden. Louisa Andersdotter was born January 1, 1861, in Sweden. Christina Andersdotter was born July 15, 1870, in Flyryd, Blekinge lan, Sweden. Christina "Christine" Andersdotter as a young woman, Sweden. Mats August Norlin, from Åmot Gävleborg Län, Sweden, left Malmö, Sweden, on June 29, 1882, with a fiinal destination of Waupaca, WI. 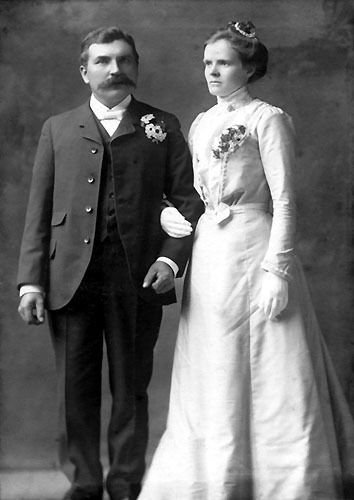 August Matias Norlin and Louisa "Louise" Andersdotter were married about 1883 in Waupaca Co., WI. 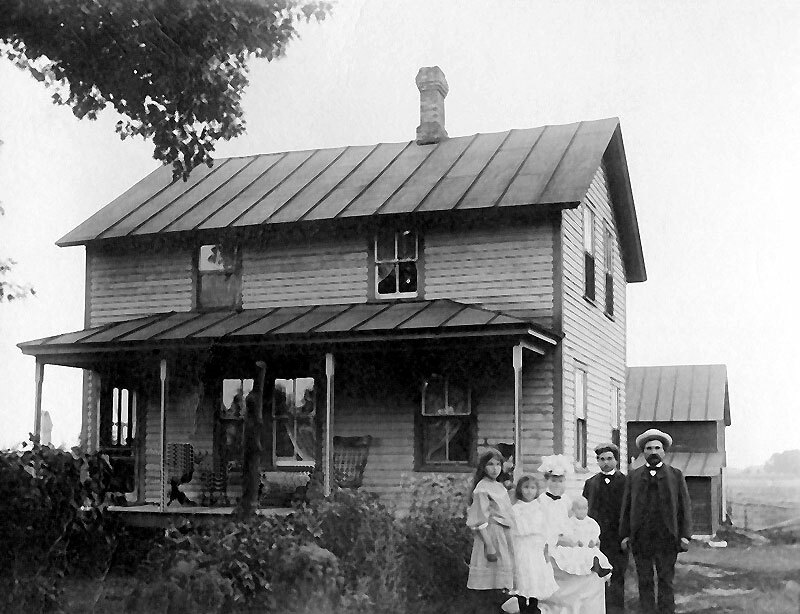 We understand that Mr. A. Peterson of Waupaca, has purchased the blacksmith shop here owned by Aug. Norlin. We are sorry to lose Mr. Norlin and wish him success wherever he may go. Leigh Larson note: This is likely to be Adolph Gustov Peterson, who eventually married Grace Norlin in 1904. The 1900 U. S. Census taken on June 1, 1900 shows August Norlin (age 43) born November 1856 in Sweden of Swedish parents is a blacksmith living in Lind Twp., Waupaca Co., WI. Living with him is his wife of 14 years, Louisa Norlin (age 39) born January 1861 in Sweden of Swedish parents. Four of her eight children are still alive. Also in the household were their children, all born in Wisconsin: Grace Norlin (age 12) born January 1888; Willie Norlin (age 9) born January 1891; Mae E. Norlin (age 4) born April 1896; and Ester L. Norlin (age 2) born June 1898. Also living in the household was Louisa's mother, Mary Anderson (age 64) born November 1835 in Sweden of Swedish parents, with her only child alive. August is shown as having emigrated from Sweden in 1882 and had Pa naturalization. Louisa is shown as having emigrated from Sweden in 1884. 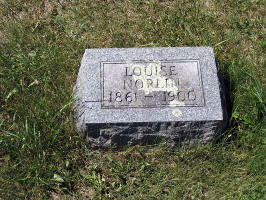 Louisa (Andersdotter) Norlin died December 5, 1900, in Waupaca Co., WI, at age 39. Sheridan Cemetery (formerly Sessions Prairie Cemetery), Farmington Twp., Waupaca Co., WI. August and Christine Norlin wedding, October 21, 1901 - Lind Center, Lind Twp., Waupaca Co., WI. 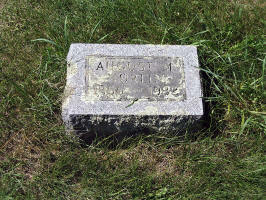 Mary (Andersdotter) Anderson died December 10, 1904, in Waupaca Co., WI, at age 69. The 1905 Wisconsin State Census taken on June 1, 1905, shows August M. Norlin (age 48) born in Sweden to Swedish-born parents is a Blacksmith living in Lind Twp., Waupaca Co., WI. Living with him is his wife, Christina Norlin (age 33) born in Sweden to Swedish-born parents. Also living there are his five children, all born in Wisconsin to Swedish-born parents: Willie A. Norlin (age 14); May E. Norlin (age 8); Esther L. Norlin (age 6); Sylvia S. Norlin (age 2); and Freda Norlin (age 6/12). August and Christine Norlin family, Waupaca Co., WI, about 1908. 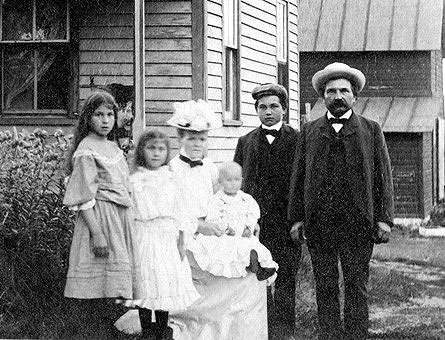 August and Christine Norlin family, Waupaca Co., WI, about 1908 (close-up). The 1910 U. S. Census taken on May 2, 1910, shows August Norlin (age 53) born in Sweden of Swedish parents is a farm owner living in in Saxeville Twp., Waushara Co., WI. Living with him is his wife of 8 years, Christina Norlin (age 38) born in Sweden of Swedish parents. Three of her four children are still alive. Also in the household were their children, all born in Wisconsin: Mary Norlin (age 14); Ester Norlin (age 11); Sylvia Norlin (age 7); Freeda Norlin (age 5); and Clarence Norlin (age 3). August and Christina are shown as having emigrated from Sweden in 1882 and August had naturalization. The 1920 U. S. Census taken on January 17, 1920, shows August Norlin (age 63) born in Sweden of Swedish parents is a farm owner living on Saxeville or Waupaca Road, in Saxeville Twp., Waushara Co., WI. Living with him is his wife Christina Norlin (age 49) born in Sweden of Swedish parents. Also in the household were their children, all born in Wisconsin: Sylvia Norlin (age 16), Freda Norlin (age 14) and Clarence Norlin (age 12). Both August and Christina are shown as having emigrated from Sweden in 1882 and had Na naturalization, dates not legible. The 1930 U. S. Census taken on April 17, 1930, shows August Norlin (age 73) born in Sweden of Swedish parents is a farm owner living in Saxeville Twp., Waushara Co., WI. Living with him is his wife Christina Norlin (age 59) born in Sweden of Swedish parents. The first marriage for August was at age 26, and for Christina was age 31. Both August and Christina are shown as having emigrated from Sweden in 1881 and had Na naturalization. Also in the household was their son, Clarence Norlin (age 22) born in Wisconsin, who is a partner in a general farm. Mats August Norlin died February 11, 1932, in Saxeville Twp., Waushara Co., WI, at age 75. Sheridan Cemetery (formerly Sessions Prairie Cemetery), Farmington Twp., Waupaca Co., WI. Mr. and Mrs. Gust Peterson, Mrs. Freda Gurholt and sons, Paul and Philip, Mrs. Freda Modeen and son, Paul, and Mr. and Mrs. John Buckman attended the funeral of Mrs. Modeen's brother, August Norlin, of Saxeville, last Sunday afternoon. The remains were brought to Weyauwega for burial. The 1940 U. S. Census taken on June 20, 1940, shows Steven Roche (age 47) born in Wisconsin and with 5 years of School and 5 years ago was living elsewhere in Waushara Co., WI, is a Farmer on a Farm who owns his farm worth $700 and is living in Marion Twp., Waushara Co., WI. Living with him is his wife, Freda Roche (age 35) born in Wisconsin and with 8 years of School and 5 years ago was living elsewhere in Waushara Co., WI. Also living there are his three unmarried children: his daughter, Norline Roche (age 17) born in Wisconsin with 3 years of High School and 5 years ago was living elsewhere in Waushara Co., WI; his son, Donald Roche (age 13)born in Wisconsin with years of School and 5 years ago was living elsewhere in Waushara Co., WI; and his son, Jerald Roche (age 10) born in Wisconsin with 5 years of School and 4 years ago was living elsewhere in Waushara Co., WI. Also living there is his widowed mother-in-law, Christine Norlin (age 69) born in Sweden and a Naturalized Citizen with 3 years of School and 5 years ago was living elsewhere in Waushara Co., WI. Christina "Christine"(Andersdotter) Norlin in later life, Wisconsin. Christina "Christine" (Andersdotter) Norlin died October 15, 1964 in Jude Nursing Home, Wautoma, Waushara Co., WI, at age 94. Buried in Saxeville Union Cemetery, Saxeville Twp., Waushara Co., WI. NESHKORO - Mrs. Christina Norlin, Neshkoro, 94, died at 11 a.m. Thursday at Jude Nursing Home, Wautoma, where she had been a patient for two years. Born in Sweden, July 15, 1870, she was married to August Norlin, Oct. 21, 1901. He died in 1932. A member of Baptist Church, Saxeville, she is survived by two sons, Clarence, Kenosha, and William, Amherst; three daughters, Mrs. Steven Roche, Neshkoro, Mrs. Earl Roche, McHenry, Ill., and Mrs. Harvey Graff, Kalamazoo, Mich., 12 grandchildren, and 26 great-grandchildren. Funeral services will be 1:30 p.m. Sunday at Saxeville Baptist Church, the Rev. Otis Predy officiating. Burial will be in Union Cemetery. Friends may call at Hempel Funeral Home, Redgranite, after 2:30 p.m. Saturday to 11 a.m. Sunday, then at the church. Adolph Peterson was born in Varmland, Sweden, Died in Rockford, IL. Buried in Arlington Memorial Park, Rockford, IL. He went to Chicago in 1900 to work for Fred Norlin making surgical instruments by hand for doctors. He bought August Norlin's Blacksmith shop at Lind Center, WI on March 2, 1908. He put shoes made out of rubber on Fanny Arbuckle's horse. He moved to Rockford in 1936 and went to work for the Hudson Manufacturing Co. He got a job there because he knew how to install a line shaft to power several machines from one shaft. The other employees could not figure out how to put the shaft up in a straight line. He became superintendent and worked there until his death, dying from a fractured neck suffered in a fall down a flight of stairs at the home of a daughter. Adolph was the oldest son and he came to the U.S.A. on a cattle boat, and was naturalized June 17, 1913, after petitioning June 12, 1913. Mrs. Mette Norlin, Route 1, Amherst, Wis. Age 78, died Sunday, October 9, at 6:15 p.m. at her home, after a lingering illness. She was born Oct. 19, 1881 in the town of Farmington, Waupaca County. Survivors are her husband William, a brother, Edward Hansen, and a sister, Mrs. Robert Stedman, both of Amherst. Funeral services will be from the Trinity Lutheran Church, Waupaca, Wednesday, October 12, at 1:30 p.m. with burial in Lakeside cemetery, Waupaca. Rev. A. S. Peterson will officiate. Friends may call at the Holly Funeral Home, Waupaca, after 3 p.m. Tuesday and at the church after 12:30 Wednesday. After a short but severe illness, Mrs. Jacob Hansen died at her home on Center Street, in this city, last Sunday morning. Her death came as a shock to the family as well as her friends, as it was thought that she was slowly gaining at the time. Mrs. Hansen is an old resident of this vicinity, having resided on a farm in Farmington until a few years since when Mr. and Mrs. Hansen moved to their present home on Center Street. She is survived by her husband, three daughters and two sons. The funeral services were conducted by Rev. Grill at the Holy Ghost church, yesterday and interment was made in Lakeside cemetery. The I. A. S. of the Holy Ghost attended in a body as Mrs. Hansen was one of the oldest members of that organization. I believe Mrs. Jacob Hansen is Christina (Peterson) Hanson, who was a sister of my great grandmother (Carrie <Peterson> Anderson). Jacob and Christina had five children: Amelia (Married Lars Larson), Edward, Mattie (or Nora), Emma (Stedman) and Elmer. If anyone knows anything or Christina's ancestry or her descendants, please email me. Herbert J. Stedman, 82, of Amherst died Wednesday, May 26, 2004, at his residence. Funeral services will be held at 1 p.m. Monday at Riverside Bible Camp. Interment of cremains will be in Badger Cemetery, town of Lanark, at a later date. Visitation will be from 3 to 6 p.m. Sunday at Holly Funeral Home, Waupaca. He was born on July 12, 1921, in the town of Lanark, to the late Robert and Emma (Hansen) Stedman. Herbert was married to Marilyn M. (Jensen) Stedman on May 29, 1948, in Waupaca. He served in the U.S. Army Air Force. Survivors include his wife, Marilyn Stedman, Amherst; daughters, Betty J. (Mark) Syverson, McIntosch, Minn., June Stedman, Thompson, Manitoba, Canada, Peggy (Gale) Higgins, Plover, Lila (Joel) Syverson, Amherst, and Amy Hester, Lakewood, Colo.; son, Lynn (Rhonda) Stedman, Amherst; sister, Beulah (Charles) Kealiher, Amherst; nine grandchildren; and one great-granddaughter. My name is Harry Sundgren, living in the Stockholm area in Sweden. I’m 65+ years old. I started to search for my roots about 3 years ago. When I was searching for my father’s mother’s mother’s, broder’s and sister’s I found your page about Christina Andersdotter. I do not know how you are related to Mats August Norlin or if you are interested to know more about his siblings. Greta 1831--1831; Anders 1832--; Anna 1834--; Brita 1837--, and Karin 1843. Karin is my fm m. The siblings had differenr Sir-names like, Matsson, Matsdotter, Matsson Norlin, Matsdotter Molin and Molin. Anders had 7 children of which 2 died before 6 year of age. Mats August was the eldest, which you know all about. 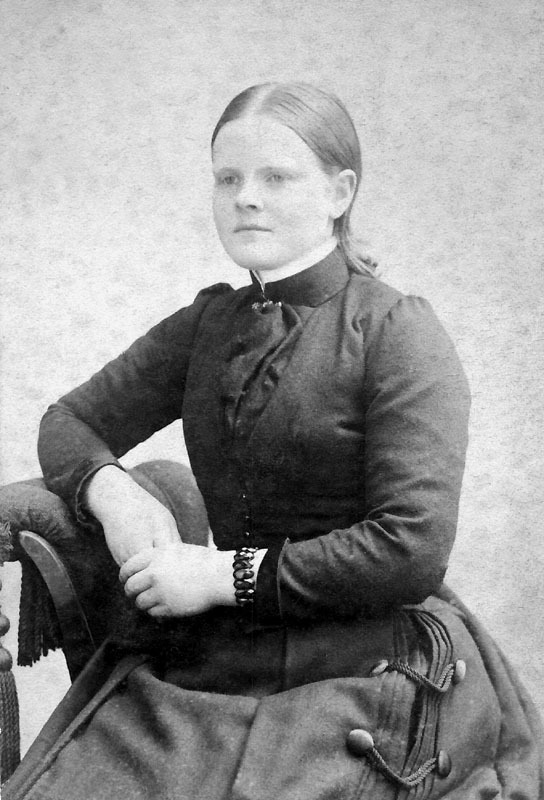 Then came Ann Christina born 1859, she had two children in the US, Frida Elisabeth Wikström married Gurholt and Anna Estella Wikström born 1891 married Nelson. Next is Catharina born 1861 married Modeen in the US. Anders Fredrik was next born 1867 married in the US with Nora Brathovde. The two youngest child died early. Anna was married in Sweden but two of her children moving to the US, Lars Johan Björk born 1867 and Carl Gustaf Björk born 1871. For the moment I do not know anything about Brita as she moved from the parish Åmot to the parish Ockelbo. The church in Ockelbo burnt down 1904 and all church books were destroyed. From another researcher I have found ancestors back to 1642. If you are interested, let me know and I can send you information. 1. AUGUST MATIAS2 NORLIN (MATIAS ANDREW1 ANDERSON) was born 17 Nov 1856 in Gestrinland, Sweden, and died 11 Feb 1932 in Waushara Co., WI. He married (1) LOUISA ANDERSON Abt. 1885, daughter of JOHN ANDERSON and MARY UNKNOWN. She was born 01 Jan 1861 in Sweden, and died 05 Dec 1900 in Waupaca Co., WI. He married (2) CHRISTINA ANDERSDOTTER 21 Oct 1901 in Lind Center, Waupaca Co., WI, daughter of ANDREAS LARSSON and ANNA-KARIN SVENSDOTTER. She was born 15 Jul 1870 in Flyryd, Blekinge lan, Sweden, and died 15 Oct 1964 in Neshkoro, WI. Immigration: 1882, Came to the USA in 1882. Immigration: 1884, Came from Sweden in 1884. Notes (Facts Pg): 1900, The 1900 Census indicates eight children, of which four are living. Notes (Facts Pg): Lived in Stockholm for a couple of years, returned home to her parents, then left for Waupaca, WI in 1892.
i. ANNA3 NORLIN, b. 16 Aug 1886, Farmington Twp., Waupaca Co., WI; d. 14 Jan 1887, Farmington Twp., Waupaca Co., WI. 2. ii. GRACE NORLIN, b. 06 Jan 1888, Farmington Twp., Waupaca Co., WI; d. 03 Jan 1951.
iii. 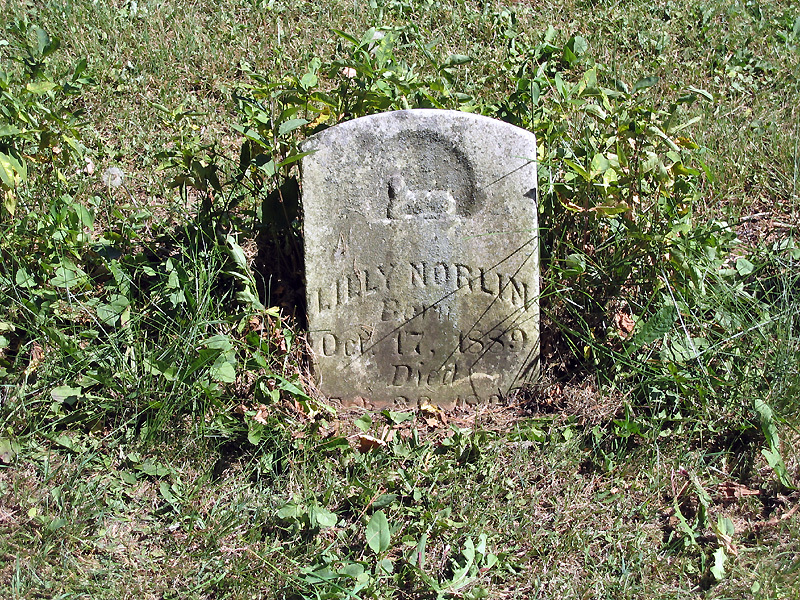 LILLY NORLIN, b. 17 Oct 1889, Farmington Twp., Waupaca Co., WI; d. 26 Feb 1890, Farmington Twp., Waupaca Co., WI. iv. WILLIAM ANDREW NORLIN, b. 31 Jan 1891, Farmington Twp., Waupaca Co., WI; d. 03 Feb 1975, Waupaca, Waupaca Co., WI; m. ELEANOR METTE HANSON, 23 Jul 1916, Waupaca, Waupaca Co., WI; b. 19 Oct 1881, Farmington Twp., Waupaca Co., WI; d. 09 Oct 1960, Route 1, Amherst, Lanark Twp. ?, Portage Co., WI. Nickname: Willie or William A. Notes (Facts Pg): In 1930 he was listed as a farmer, living in Lanark Twp., Portage Co., WI. v. ROYAL AUGUST NORLIN, b. 29 Jul 1892, Farmington Twp., Waupaca Co., WI; d. 22 Nov 1892, Farmington Twp., Waupaca Co., WI. vi. ROSE MYRTLE NORLIN, b. 03 Sep 1894, Lind Twp., Waupaca Co., WI; d. 04 May 1895, Lind Twp., Waupaca Co., WI. 3. vii. MAE ELSIE NORLIN, b. 02 Apr 1896, Lind Twp., Waupaca Co., WI; d. 10 Nov 1922, Wisconsin. viii. ESTHER LILLIAN NORLIN, b. 12 Jun 1898, Lind Twp., Waupaca Co., WI; d. 20 Mar 1976, Round Lake, Lake Co., IL; m. (1) UNKNOWN ANDERSON, 11 Nov 1922; m. (2) UNKNOWN SMITH, Aft. 1923.
ix. RUTH EVELYN NORLIN, b. 05 Oct 1900, Lind Twp., Waupaca Co., WI; d. 05 Jan 1901, Waupaca Co., WI. 4. x. SEIGRID SYLVIA BORALIND3 NORLIN, b. 23 Jan 1903, Waupaca Co., WI; d. 29 Apr 1999, Mc Henry, Mc Henry Co., IL. xi. REUBEN A. NORLIN, b. 08 Apr 1904, Waupaca Co., WI; d. 04 May 1904, Waupaca Co., WI. 5. xii. FRIDA MARIA CONSTANCE NORLIN, b. 16 May 1905, Waupaca Co., WI; d. 12 Dec 1980. 6. xiii. CLARENCE ROGER NORLIN, b. 17 Jan 1907, Waupaca Co., WI; d. Jul 1984, Wild Rose, Waushara Co., WI. 2. GRACE3 NORLIN (AUGUST MATIAS2, MATIAS ANDREW1 ANDERSON) was born 06 Jan 1888 in Farmington Twp., Waupaca Co., WI, and died 03 Jan 1951. She married GUSTOV ADOLPH PETERSON 22 Jun 1904 in Wisconsin, son of ANDRES PETERSON and KRISTINE UNKNOWN. He was born 26 Mar 1879 in Varmland, Sweden, and died 26 Apr 1951 in Rockford, IL. 7. i. NORLIN ALEXANDER4 PETERSON, b. 29 Oct 1905, Waupaca Co., WI; d. Mar 1985, Freeport, Stephenson Co., IL. ii. FAYETTE LOUISE PETERSON, b. 18 May 1909, Waupaca Co., WI; d. 13 May 2002, Prather, Fresno Co., CA; m. RAGNER GEORGE ANDERSON. iii. CECIL LAURELL PETERSON, b. 22 Mar 1914, Waupaca Co., WI; d. 29 Jun 1996, Lancaster, CA; m. DORIS LEWIS, 23 Apr 1940, Dubuque, IA; b. 12 Mar 1919, Hattiesburg, MS; d. 09 Jan 1983, Panarama City, CA. iv. HILDA GRACE PETERSON, b. 02 Nov 1922, Waupaca Co., WI; m. ROBERT G. FREDERICKSON. v. LANE A. PETERSON, b. 18 Jun 1925, Waupaca Co., WI; d. 01 Nov 2001, Loves Park, Winnebago Co., IL; m. BEVERLY M. UNKNOWN; b. Abt. 1929. 3. MAE ELSIE3 NORLIN (AUGUST MATIAS2, MATIAS ANDREW1 ANDERSON) was born 02 Apr 1896 in Lind Twp., Waupaca Co., WI, and died 10 Nov 1922 in Wisconsin. She married JOHN HENRY ARMON Abt. 1915, son of UNKNOWN ARMON and MARY UNKNOWN. He was born 08 Nov 1893 in Waupaca Co., WI. i. MARY4 ARMON, b. Abt. Jan 1917, Wisconsin. 4. SEIGRID SYLVIA BORALIND3 NORLIN (AUGUST MATIAS2, MATIAS ANDREW1 ANDERSON) was born 23 Jan 1903 in Waupaca Co., WI, and died 29 Apr 1999 in Mc Henry, Mc Henry Co., IL. She married EARL ROCHE Abt. 1920 in Wisconsin, son of CHARLES ROCHE and ROSIE UNKNOWN. He was born 07 Dec 1898 in Seneca Twp., Green Lake Co., WI, and died 09 Apr 1989 in Mc Henry, Mc Henry Co., IL. i. ANITA4 ROACH, b. Abt. 1922, Seneca Twp., Green Lake Co., WI. ii. MAY ROACH, b. Abt. 1923, Seneca Twp., Green Lake Co., WI. iii. HAROLD ROACH, b. Abt. 1924, Seneca Twp., Green Lake Co., WI. 5. FRIDA MARIA CONSTANCE3 NORLIN (AUGUST MATIAS2, MATIAS ANDREW1 ANDERSON) was born 16 May 1905 in Waupaca Co., WI, and died 12 Dec 1980. She married STEPHEN ROCHE 18 Nov 1922, son of CHARLES ROCHE and ROSIE UNKNOWN. He was born 27 Jun 1892 in Seneca Twp., Green Lake Co., WI, and died 20 Apr 1970 in Parkview Nursing Home, Berlin, WI. 6. CLARENCE ROGER3 NORLIN (AUGUST MATIAS2, MATIAS ANDREW1 ANDERSON) was born 17 Jan 1907 in Waupaca Co., WI, and died Jul 1984 in Wild Rose, Waushara Co., WI. He married ANNE GRAY 25 Jul 1936. 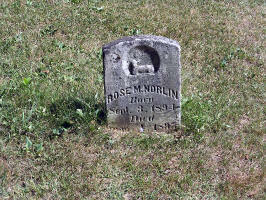 She was born 10 Feb 1910, and died Apr 1984 in Wild Rose, Waushara Co., WI. 7. NORLIN ALEXANDER4 PETERSON (GRACE3 NORLIN, AUGUST MATIAS2, MATIAS ANDREW1 ANDERSON) was born 29 Oct 1905 in Waupaca Co., WI, and died Mar 1985 in Freeport, Stephenson Co., IL. He married VIOLET HILDA ERICKSON 25 Jul 1928.
i. DONNA LEE5 PETERSON, b. 27 Sep 1931; d. 27 Sep 1931.
ii. GLADYS VIOLET PETERSON, b. 28 Mar 1933; d. 28 Mar 1933. 8. KAREN4 ROCHE (FRIDA MARIA CONSTANCE3 NORLIN, AUGUST MATIAS2, MATIAS ANDREW1 ANDERSON) She met UNKNOWN HUSBAND.